This state-of-the-art heat pipe cooler is the flagship of the company. With a thermal resistance Rth of just 0.1K/W, this cooler creates up to 100.000 lumen of white light, or 2.000μmol/s in the horticulture PAR spectrum. 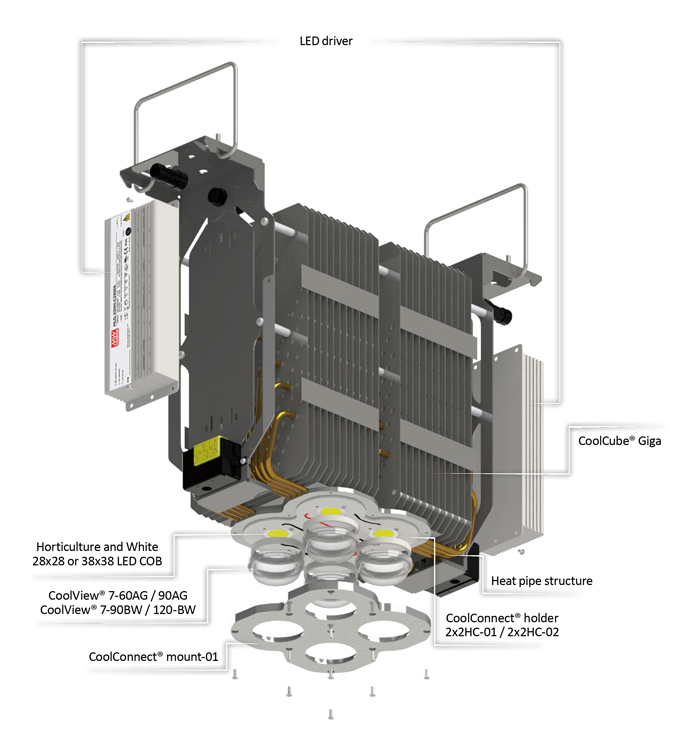 The heart of the CoolCube® is a sophisticated quadruple COB or LOB LED engine platform, with 16 sintered heat pipes transporting the heat to a stack fin structure. The CoolCube® is designed from an overall limited width perspective (width of just 20cm), what makes it the ideal platform in greenhouse horti cultivation for daylight extension and supplemental lighting with a limited shade footprint. The LED engines can be combined with a variety of lenses from Ledil (Stella series) and Khatod (SIO3 Junior) – in these lenses you will find a wide score of beam angles, from classic high bay beams to narrow angles for high mast applications and complex batwing structures for an even light dispersion over your plants.